Stay in tune with the incredible RACKTUNER BTR2000 from BEHRINGER. This multi-functional rack tuner is destined to become a staple of your studio and live set-up. The BTR2000 will tune any stringed instrument in your arsenal. Press the Mode/Fine button to select from 11 different tuning modes: Chromatic, Guitar, Bass, Baritone, Banjo, Ukulele, Open D, Open E, Open G, Open A and DADGAD. You can choose to tune by plugging directly into the BTR2000, using the built-in microphone or tuning to a reference tone. When playing with orchestras, the standard “A” pitch can vary. That's why the BTR2000 can be calibrated 12 Hz higher or lower than 440 Hz. But that’s not all—the BTR2000 is also a fully adjustable metronome! Access this handy tool via the Sound/Metronome button. Select your BPM, then watch and listen as the BTR2000 keeps time optically and acoustically. The front panel features a 1/4” Input jack for connecting your instrument. You can choose to plug in two instruments via the 1/4” Input jacks on the back panel. Use the 1/4” Sound jack to output metronome and reference tone sounds. The 1/4” Main jack can output either the sounds generated by the BTR2000 and the instrument signal, or the instrument signal alone. The Mute and Select 1/4” jacks are for connecting footswitches such as the BEHRINGER A/B SWITCH AB200 or BEHRINGER FS112. Depending on your footswitch capacity (single or double), you can use it to mute the Main output, toggle between Input 1 and Input 2/Mic inputs, or activate/deactivate the metronome. 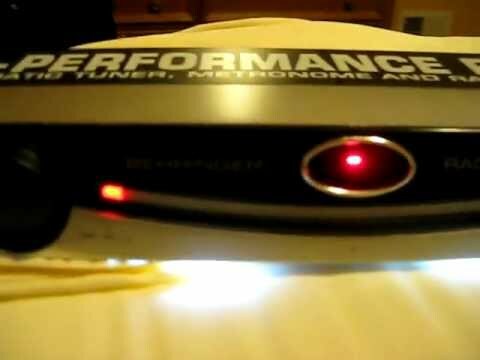 No musician should be without a precise, reliable tuner. The BTR2000 gives you that and more for a price that is within every musician’s budget. Check it out today at your nearest BEHRINGER dealer.